- 9.0 cm *11.7 cm. - Available in attractive colors. 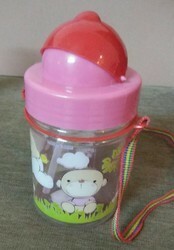 Owing to devoted experts, we have been competent to present a wide range of Baby Sipper Bottle. These products are made as per industry norms and standards. - Cute apple shape design for baby more fun. - Special design for easier holding and avoid unpleasant rolling. 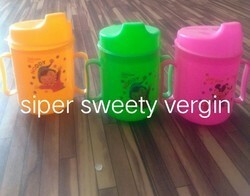 Material: Food Grade Polycarbonate material Slipper with Spout Cap & Straw Lid. Keeping track of contemporary market development, we are devotedly occupied in providing an extensive series of Baby Smart Sipper. Our organization is well known in the industry for catering a distinguished segment of Baby Straw Sipper. These products are designed from high quality fabric.